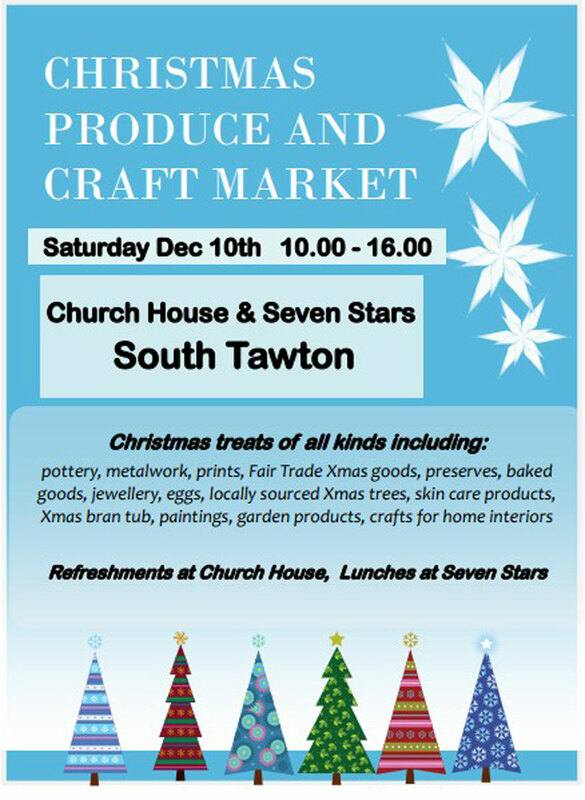 All roads on December 10th lead to South Tawton where we hold our first festive market with gifts and treats galore from local craftspeople and producers to help provide that unique Christmas gift. It will be bigger and better than ever and will be open all day from 10.00 in the morning until 4.00 in the afternoon. Neil Edgson: newly arrived potter based at the Kigbeare Centre at Southcott. 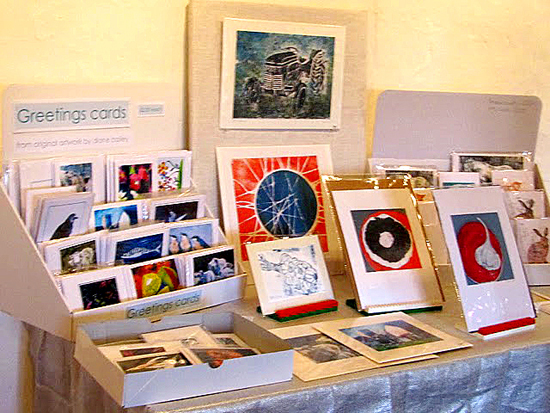 Neil will also be showcasing work from some of the other makers from the Centre. Sarah Guscot: a new resident of Taw Green who is just about to launch an online boutique selling hand crafted country home and shabby chic items, many of the products being crafted in Devon and Somerset, along with fairtrade items from overseas. At the time of going to press we are waiting for confirmation of attendance from a number of other traders. 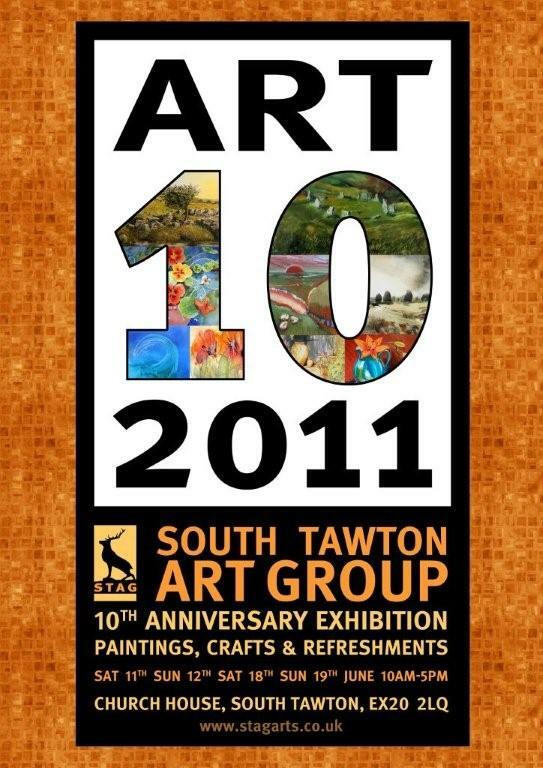 If you would like a stall, please contact Mark Freeman (e-mail: townbarton@gmail.com, tel: 01837 840085). 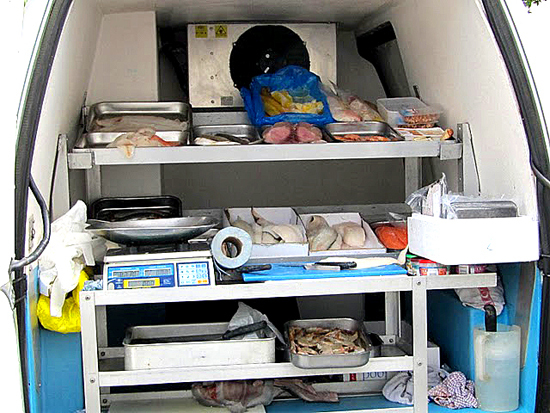 To accommodate the increase in the number of vendors, the Seven Stars has kindly agreed to allow some stalls to be sited there. 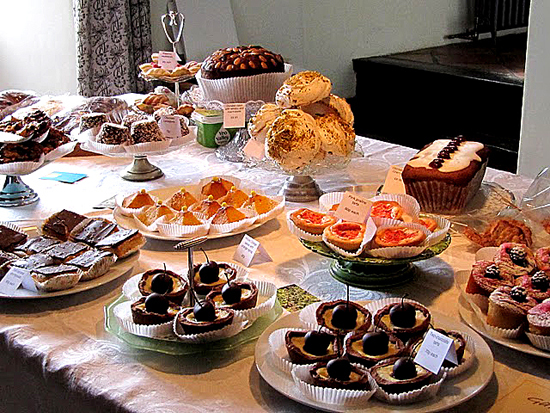 They will also be offering a special lunchtime menu to tempt visitors while teas and coffees will be available during the morning and afternoon at Church House. ‘The Get Changed Theatre Company would like to say a big thank you to the trustees of the Church House for their warm and welcoming hospitality and for the use of their most wonderful and historic building for our recent fund raising art auction. 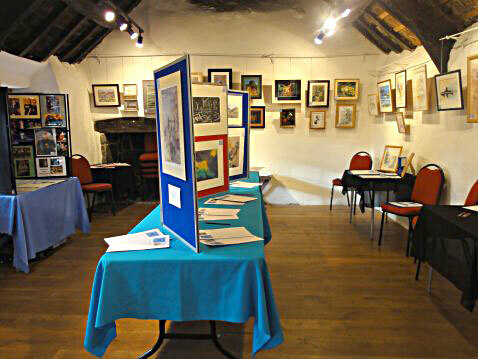 The facilities worked well for our event with excellent art hanging facilities and lighting. 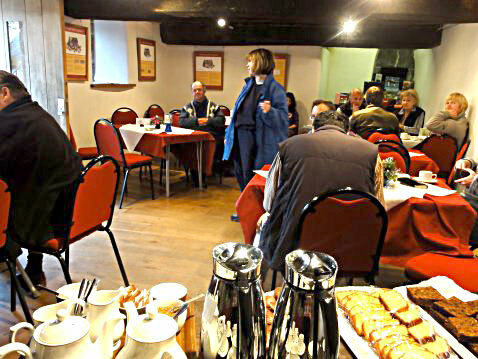 Full catering facilities enabled us to enhance our fundraising by providing all day refreshments for our visitors too. A special thank you to Mark Freeman and David Youle for all their personal help both before and during the day, it was very much appreciated’. Firstly, apologies for the scaled-down nature of this month’s market. 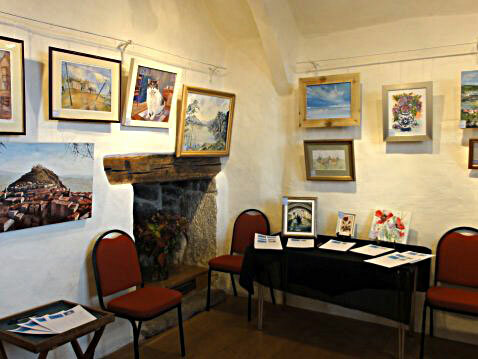 Several regulars were unable to attend because of holidays or other commitments and we cannot use the upstairs room because of the exhibition there (booked eighteen months ago). The stallholders were intending to sell outside in the square – and then we saw that the Met Office was forecasting heavy rain for this Saturday morning… A shame – but, hopefully, we will be back to full strength next month. 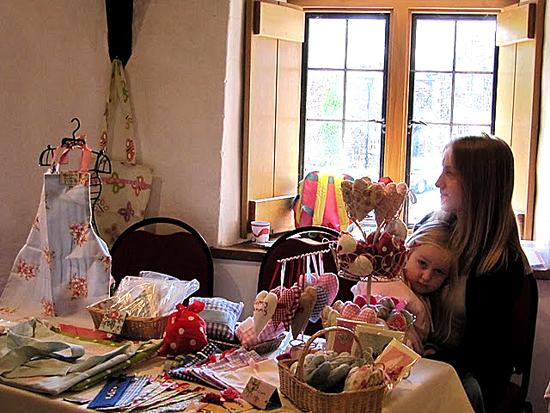 Indeed, with new vendors wishing to set up their stalls, October could be a bumper month! 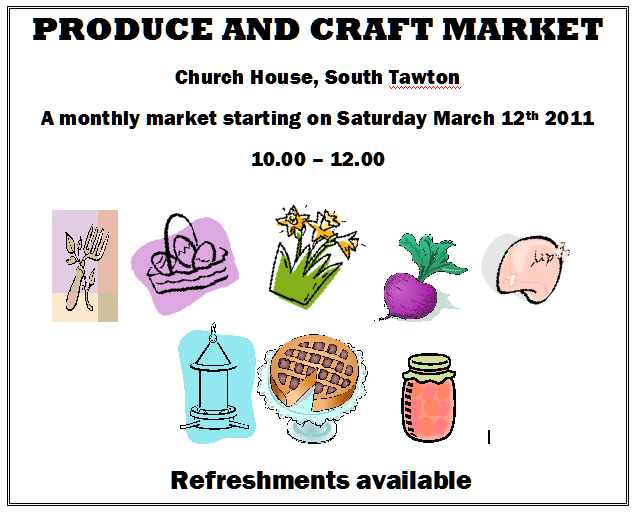 If you wish to have a stall at the October market, please contact Mark Freeman at 2 Town Barton, South Tawton, Tel: 840085, e-mail: townbarton@gmail.com) Remember that you can always elect to share a table with a neighbour or friend. Progress has been made with the village square enhancement. Reclaimed setts have been laid where the old trough used to be (thanks to Mike and Mark) and the National Park is assisting us in trying to locate other setts to go underneath the notice board. Some sample setts were delivered, but unfortunately these were considerably bigger than the unusually slender setts which have been used in the square. We’ll keep on looking. On Sunday September 18th at 2.30 p.m. we will be planting some 500 bulbs. If you can spare an hour or so, please do bring along your bulb-planters and trowels and join us. We intend to plant up the trough, the area under the oak tree and along the southern side of the square with daffodils, tulips and narcissi – which should brighten up the square come the springtime. Six of us have just finished planting about 400 bulbs in S Tawton. Mole Avon donated 2000 litres of compost (20 bags of which we used 10) We are going to offer the other bags as prizes when we next hold a draw on a market day. Since they weigh about 50Kg each, we will deliver any to a winner, unless they live overseas! Firstly, many thanks to David Muir who has volunteered to staff the Church House stall – and thanks to those of you who have given donations. And welcome this month to the new stallholders who are offering books for sale (a first for our market). Welcome also to local MP Mel Stride who will not be running a stall, but will be holding a surgery in the East Chamber upstairs. 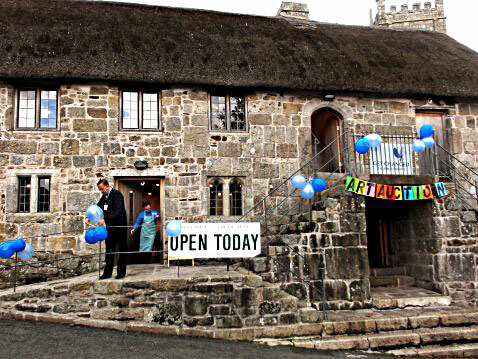 Many of you were present on July 30th when the community celebrated David Youle’s 80th birthday and presented him with a framed illuminated manuscript and a giant key representing the freedom of the village of South Tawton. These are on display downstairs. A record of the event has been compiled in book form and this will be presented to David at 10.30 this morning. Listen out for the bell! 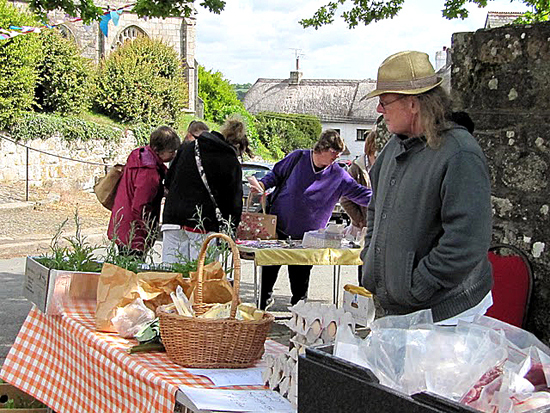 If you wish to have a stall at the September market, please contact Mark Freeman at 2 Town Barton, South Tawton, Tel: 840085, e-mail: townbarton@gmail.com) Remember that you can always elect to share a table with a neighbour or friend. What better way to dispose of any gluts of fruit and vegetables? Plans for enhancing the village square advance. The trough has now been planted up with heathers and Dartmoor National Park has let us have some reclaimed setts to go where the trough used to sit underneath the oak tree. The laying of these will take place over the next couple of weeks. The National Park is assisting us in trying to locate other setts to go underneath the notice board, but these will have to be paid for through fund raising. In September the trough and the area under the oak tree will be planted with bulbs – which should brighten up the square come the springtime. The Folk Festival workshops were very successful this year. Andy Frangleton intends to put more popular workshops in Church House next year and judging by the number of people who strolled up on Friday, Mark Freeman suggests that we need to be open on all 3 afternoons of the Festival next year. 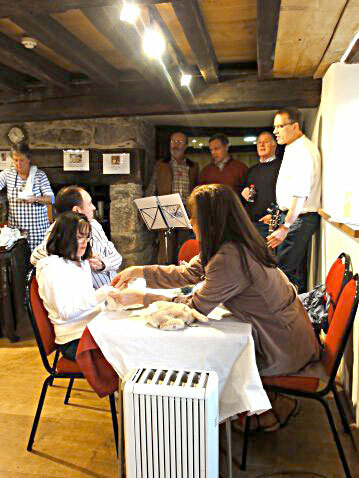 Market day on Saturday had 12 stalls, including a Church House one run by the "Pioneer Priest" living in the Rectory. The local M. P. is coming to Church House soon to meet the people and run a constituency surgery in the East chamber. 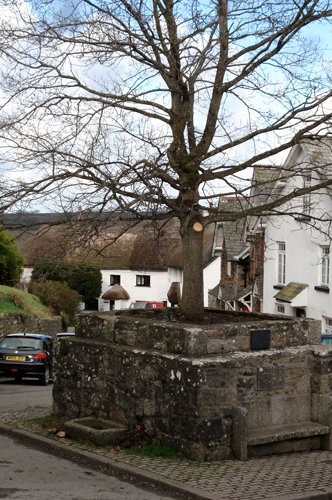 The granite trough outside Church House has now been moved and planted with heathers, and the Dartmoor National Park Authority have agreed to donate us granite setts to fill in the gap left alongside the Cross Tree. 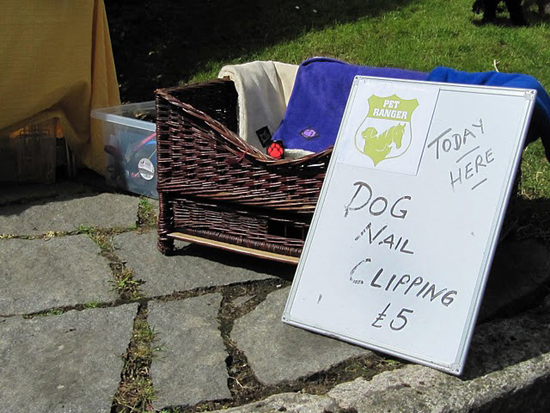 Denise from Pet Ranger offered a very popular service for dog owners. 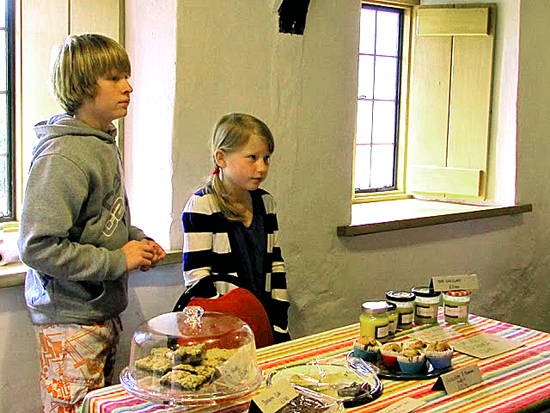 Two young villagers selling their home made curd and sweet treats - in aid of the bike fund! Not a stall for thr calorie conscious. Please allow time (maybe 10-20 seconds) for the photos to load after choosing any row, as there are many of them. There has been a lot of activity in the village square in recent weeks. Dave Sampson and Sean McCaffrey have donated rotted manure and top soil respectively and the area under the oak tree has been cleared ready for planting. The setts underneath the tree have all been hand-weeded and the trough cleared, ready for removal to a new site outside Church House. 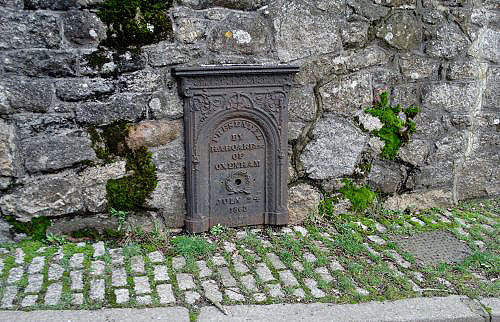 Removal of the over-grown grass and weeds on the south side of the square has revealed setts by the post box which had been hidden for years and granite slabs in front of the bench. The grit bin has been moved to a less prominent position, the hedge trimmed and snowdrops, donated by villagers, have been planted on the grassy bank. On Saturday March 19th a meeting was arranged in the square with members of the Parish Council who were enthusiastic about the changes wrought over recent weeks. At the council meeting on March 21st they were due to discuss how the Parish Council might support future development – including a contribution to the purchasing of further setts (to go in front of the village notice board) and lobbying for the resurfacing of the square. Much has been achieved in a very short space of time. This is a brief outline of a meeting of the planning committee for June's Church Ale to give some indication of the probable content. It gives only the bare bones of the event which, in practice, always turns into a very enjoyable afternoons local entertainment. 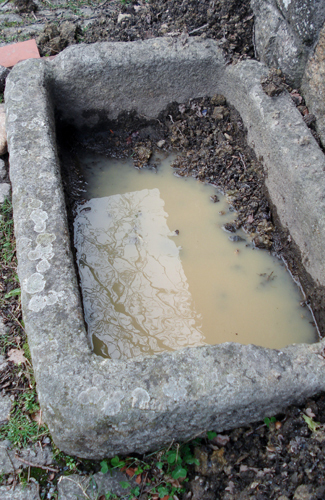 Trough: PC had contacted Dartmoor National Park who had offered to drill holes in the trough so that it could be used as a planter, the remainder of the cost to be met by the Parish Council. Best positioning of the trough discussed plus the desirability of purchasing other granite troughs for the square. PC to contact again to try to expedite proceedings. Working Party later cleared trough of litter, leaves and clay which had accumulated. Established that the trough was much deeper than had originally been thought. Once moved, trough to be planted with bulbs and heathers. Clay not removed from side of trough as it might be needed to be packed under trough once moved onto new sloping site below Church House railings. Grassed area: problems with fouling and litter discussed, the opportunity afforded by the notice board to promote the village and possible enhancement of this area discussed. Working Party established that area in front of post box was actually paved with granite setts which had been completely covered with grass. Grass now removed. Granite slabs also present in area around bench. 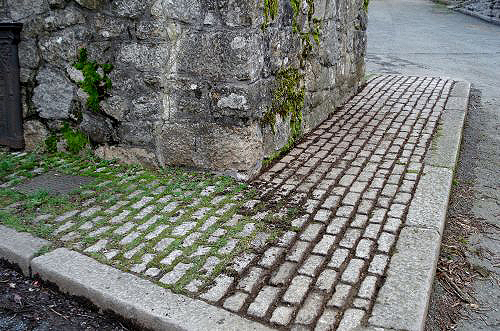 MF to write to the Parish Council requesting support re- putting granite setts in front of notice board, providing an additional litter bin by the bench and permission to clean up and put wood preservative on notice board and bench. Permission also to be sought to make better use of the notice board by putting up backing paper, including pictures and regularly updated information about the village. Intention of planting grassy bank to right of the bench with bulbs. Planting: the majority agreed that the square would be enhanced with some appropriate restrained planting. Working party cleared area underneath oak tree of weeds and made a start at hand-weeding between granite setts surrounding the tree. Agreed that systemic weed-killer would only be used if weeds reappeared at a rate which volunteers felt unable to cope with. A mixture of fine sand and cement to be brushed in between setts. MF to approach Dave Sampson re- offer of manure and AW to approach Sean McCaffery re- provision of top soil. SF produced list of suitable plants to grow under the oak tree. Members of the working party volunteered to donate some plants/shrubs. Some funds needed initially to purchase items such as wood preservative and bulbs. Agreed that a raffle at the monthly produce market , the first of which is to be held on March 12th, would be a possible source of income. 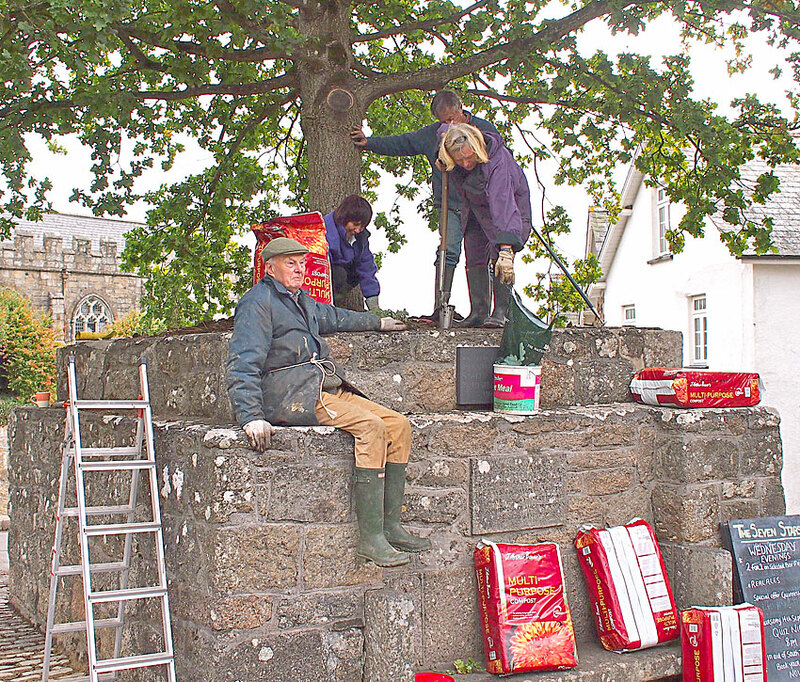 Individual members of the working party agreed to continue with the clearing of weeds from the setts around the oak tree when they had spare time and the weather was clement. Prizes for raffle requested. To be given to MF/SF at 2 Town Barton. Volunteer to sell raffle tickets at Produce Market sought. Date for next meeting of the working party dependant on delivery of manure and top soil. MF to circulate date and time. The Parish Council has requested a site meeting to consider our proposals on Saturday March 19th at 11.00 a.m. Do join us if you can. The setts in front of the post box have been cleared and Dave Sampson is letting us have some manure this weekend to go under the oak tree. Several people have mentioned that they would like to see snowdrops in the square. As they are best planted ‘in the green,’ if anyone has some clumps which they are dividing up and would like to donate, they would be much appreciated. 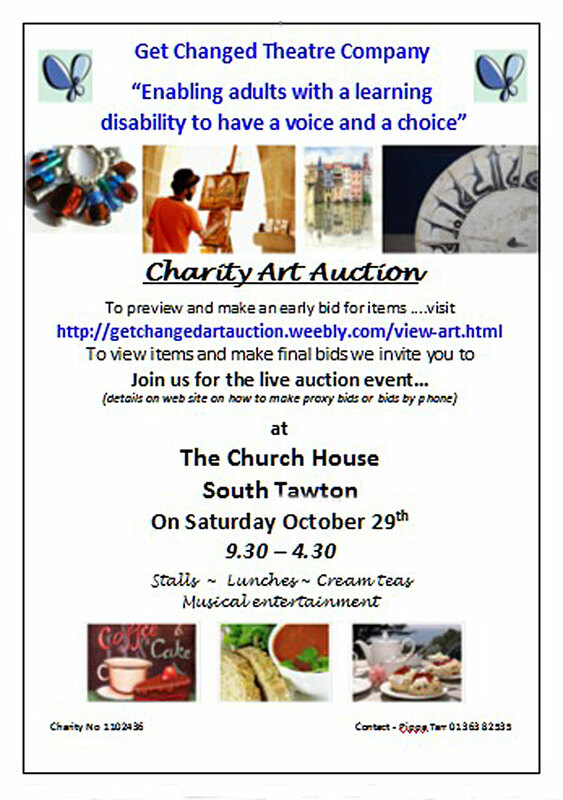 There will be a raffle to raise money for bulbs, plants, wood preservative etc. at the market. Peter Craske has volunteered (or rather Deborah has volunteered him!) to sell raffle tickets. Any prizes gratefully received. One or two individuals have said that they will come and do some further work in their own time, but Susan and I will be out on Sunday afternoon week (March 6th) if anyone cares to join us. The advantage of coming together is that we can get a lot done in a short space of time – and there’s also a good chance of tasting some trial offerings from the oven in readiness for the market the following weekend! 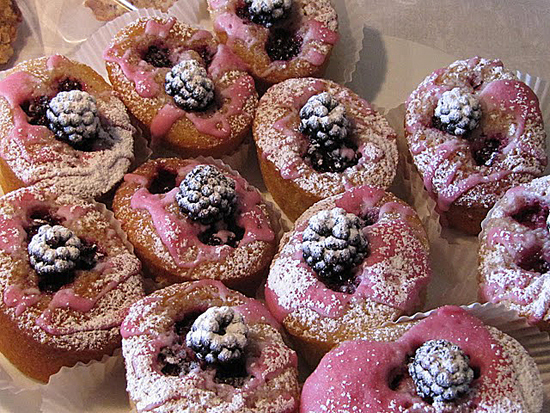 The Inaugural Church House market Is to be held on Saturday March 12th. The aim is to provide an opportunity for villagers to come together socially and to offer an outlet to local small-scale producers. To date, vendors have requested stalls to sell garden produce, eggs, baked goods, preserves, garden products, jewellery, cards, paintings, soaps and organic dog food. It’s not too late to take a stall. Any local producer who would like to do so should contact Mark Freeman at 2 Town Barton, e-mail townbarton\@gmail.com; Tel 840085.